I love so many things about it: the painted ceiling, the incorporation of black, the eclectic Tim-Burton-esque letters on the wall, and the use of imperfect furniture. 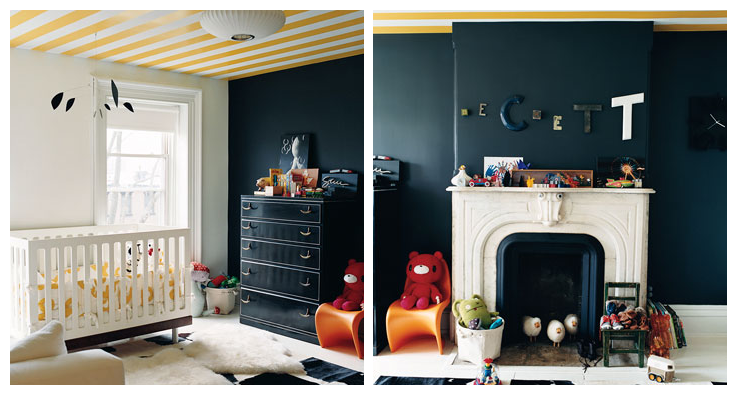 The nursery belongs to Jenna Lyons’ son, Beckett. Lyons is the creative director at J.Crew: an enviable job with style as a prerequisite for sure! You can see more of her whole house here at Design Actually. I know I’ve posted pictures of the dining room before, which is incredible. All kinds of media outlets are up in arms about this pictorial for reasons ranging from gender identity confusion to concern over the well being of the boy. If you know me, you know that I couldn’t CARE LESS if a boy wants to paint his toes pink, shove them into pink shoes, and throw a pink purse over his shoulder as he makes his way out to his pink Mary Kay Cadillac. I doubt this picture means anything except a mom and a kid goofing around, but unfortunately there’s a mini media storm surrounding it. A media storm about a little kid hanging out with his mom in a J.Crew catalog – seriously. The thing that actually does cause me to raise an eyebrow is putting a child into the public eye who didn’t ask to be put there. I am squeamish about bloggers who blog with abandon about their school-aged children and teachers who write about their students on Facebook (which is a big NO, right?). As a formerly chunky child, I was upset a few weeks ago to read the news that Michelle Obama had used her own young daughter as an example to encourage other parents to monitor the weight and nutritional needs of their children; with information being so readily accessible these days, I find that kind of conduct virtually begging for some mean spirited child or parent to instigate a moment of humiliation, be it intentional or unintentional. My point is, a kid never knowingly asks for this kind of attention, and if they do it’s our job to protect them. So despite my love of J.Crew clothing and my general feelings on pink toenails (they are excellent), I feel like this image has a greater chance of causing conflict for this little boy than it has of causing joy. I feel like this is a picture that is adorable, and should have been put in an album to exist as a fun memory. I feel like if this was staged by a sophisticated company that knows how PR works, that it was a move that made a four-year-old boy the target of a bunch of over zealous issue-mongers and that that’s not a fair price to pay for oodles of cuteness. It’s sad. But honestly, all I really want is for people to stop talking about this piece of “news” so that my Beckett can go back to being the only Beckett in the room. Ok? …and I thought we’d come up with such an original name!